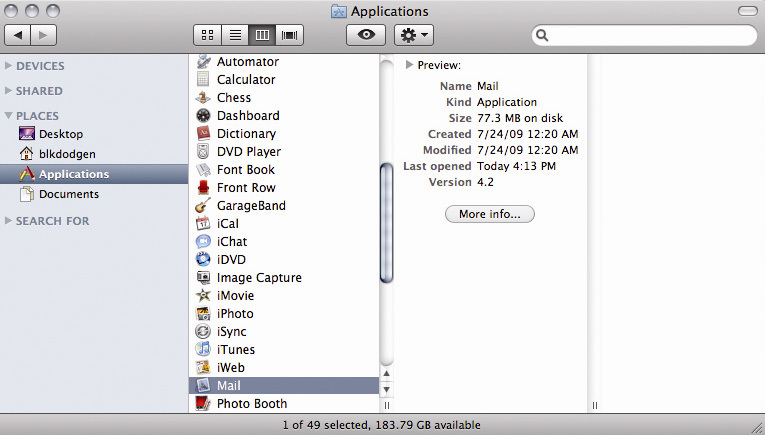 From the Finder, go to Applictions, then Mail. Fill out the correct e-mail account information. In the Full Name box, enter the name you would like to appear on sent emails. 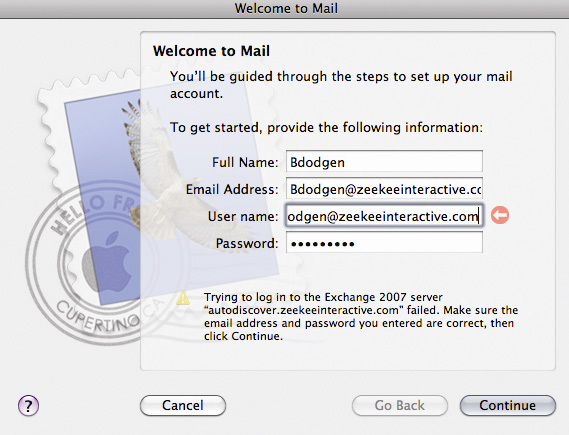 In the Email Address box, make sure to include your full email address as shown. Your Password will be your email password. Click Continue. 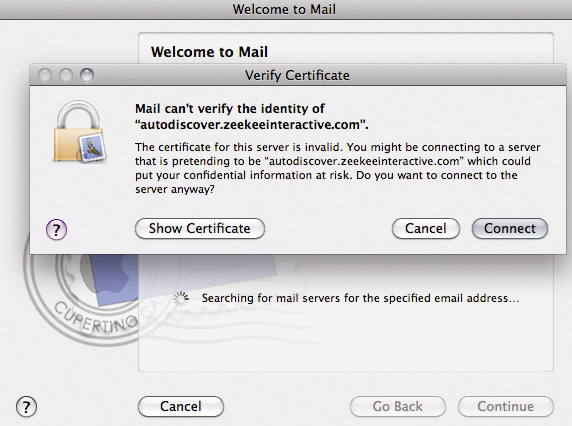 Mail may not be able to verify the identify of the server, If this happens, a Verify Certificate will pop up. You are given the option to ask for the certificate. 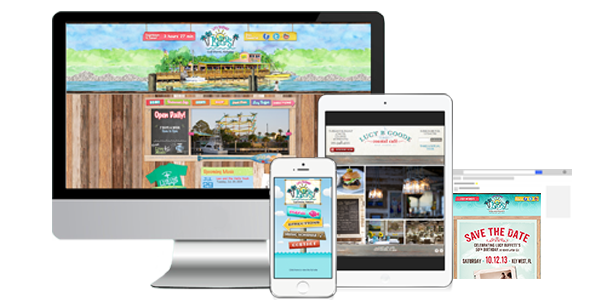 If you wish by clicking Show Certificate. To advance to the next step, click Connect. If you receive this message, check your email address and password to make sure you entered them correctly. Another reason you may see this message is because of and User name. 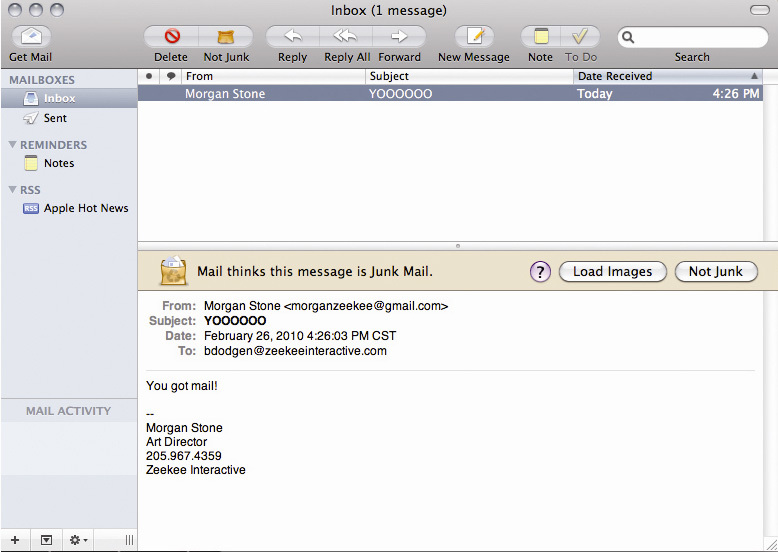 The User name may be filled automatically like below, but without the full Email Address. 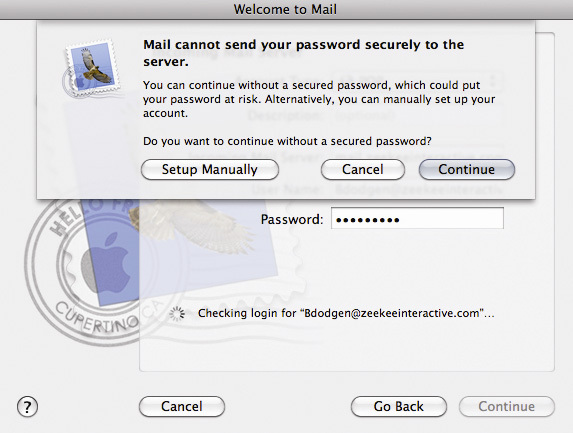 To correct this, make sure User name information is identical to the Email Address information. An easy way to identify an error is by the red-encircled arrow pointing to the field that may need corrections, in this case the User name. 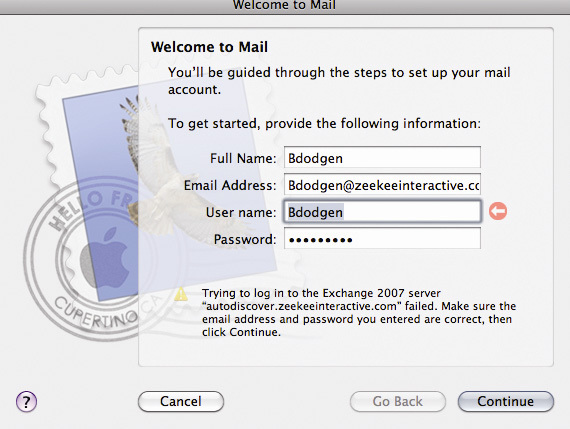 The corrected User name field should look similar to the below image, matching the Email Address field exactly. Click Continue. This is the Incoming Mail Server setup page. The Account Type default should be fine. An optional Description box is available. 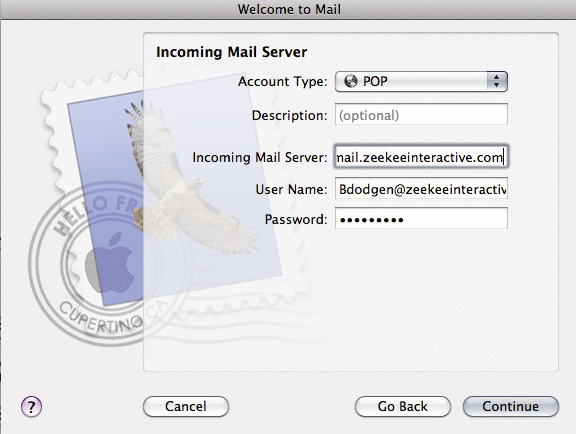 In the Incoming Mail Serverbox, type: mail.zeekeeinteractive.com. 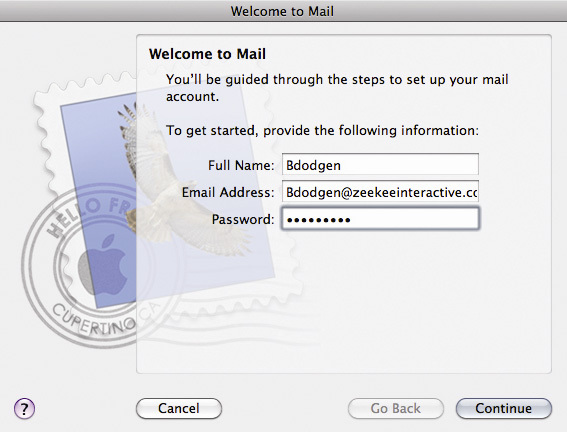 Fill in the User Name and email Passwordboxes if this step isn't done for you already, making sure the user name is the same as your complete email address. Click Continue when finished. You may receive a message similar to below. 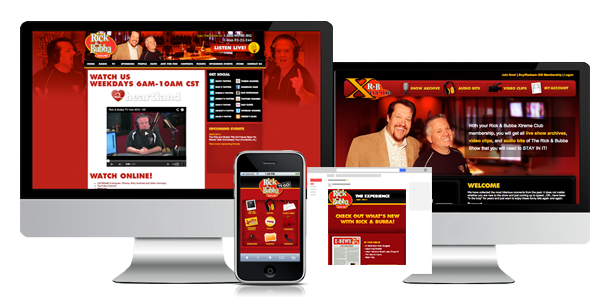 From here, you can Setup Manually or just click Continue. 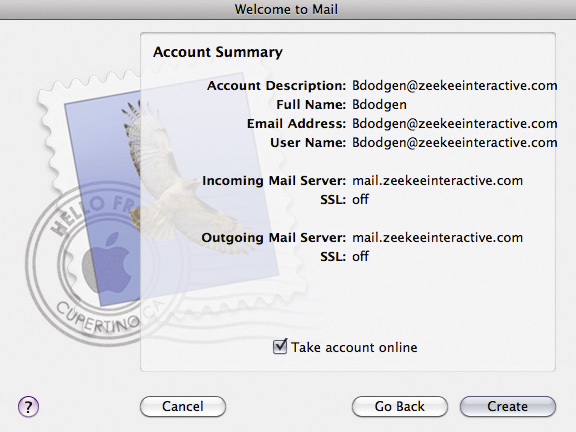 After clicking Continue, you will advance to Outgoing Mail Server setup page. The Description box is optional. 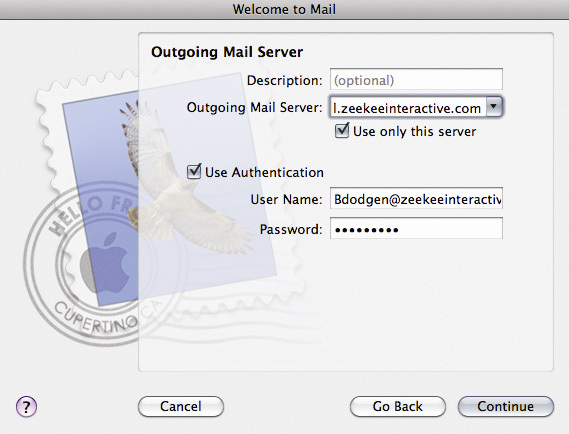 For the Outgoing Mail Server, type:mail.zeekeeinteractive.com. Check the Use Authentication box and press Continue to proceed. 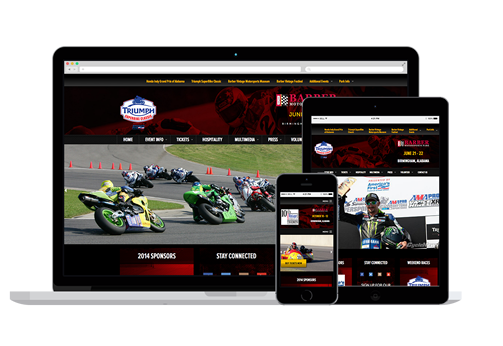 For the final step, simply make sure the Take account online box is checked and click Create. After clicking Create, you should be directed to a page similar to this one. From here, you can compose, send, and receive mail.